Today’s bargain report is short–not even any CVS bargains to report. I hope to have some of those next week. I just didn’t need anything they had on sale this week. However, I am extremely excited about this first bargain to tell you about. “Is that a garden sprayer?” you ask. “Why, yes it is!” I reply. “It doesn’t take much to get you excited, does it?” you query. “Why, no it doesn’t!” I reply. Let me give you a brief history of why this bargain has excited me more than any CVS special or estate sale buy has in the past few weeks. I mentioned in one of my early saving money posts that we decided to let go of our monthly exterminating contract and do our own spraying. My old garden sprayer was quite ancient. I inherited it from a relative who has been deceased close to 15 years, and he had probably owned it for at least 30-40 years before that. 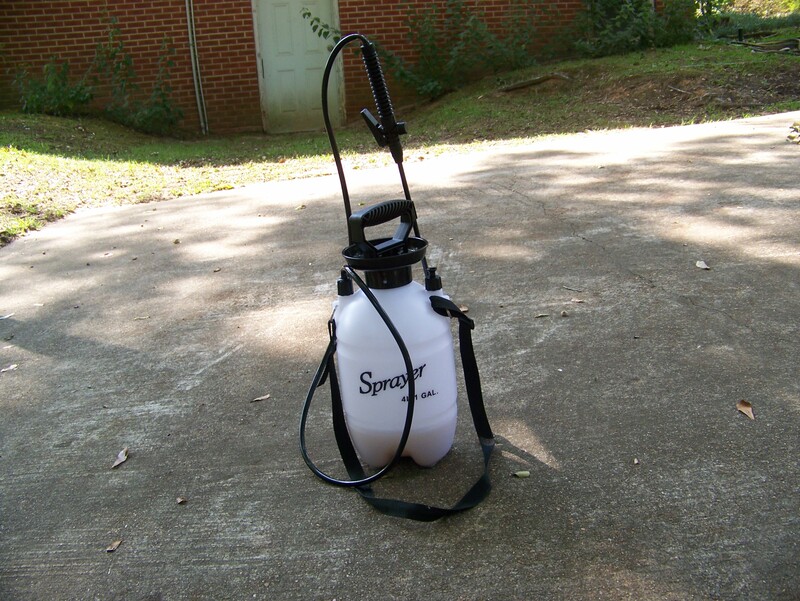 When I got ready to do the monthly spraying this week, I could not get it to pump. I thought that I was doing something wrong, so I asked David to look at it when he got home. Cutting to the chase: the old sprayer had finally bitten the dust. A day or two later I was in Dollar General and saw one sprayer left in the outdoor aisle. I had already hunted at Wal Mart and could not find one. This incident had me realize that sprayers are probably considered seasonal items, so I was a little nervous that I might not find one. Thinking that I was lucky to find it, I snatched it up. It was $12, but I figured it was worth it. What an unexpected pleasure to watch it ring up for half price! 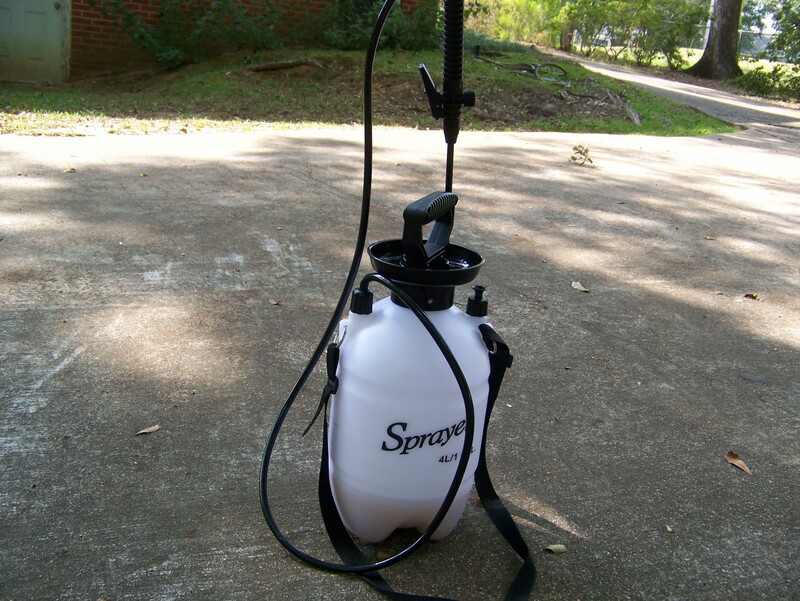 Yep, this great new sprayer was only $6! Not only did I get it for half price, but also I got a sprayer with a couple of great features. Do you see that strap? It was so easy to put it over my shoulder and do the spraying this morning. The other handy little feature is the clip on the side of the handle. I just stick the nozzle in it, and I don’t have to lay the nozzle on the floor of the garage any more. 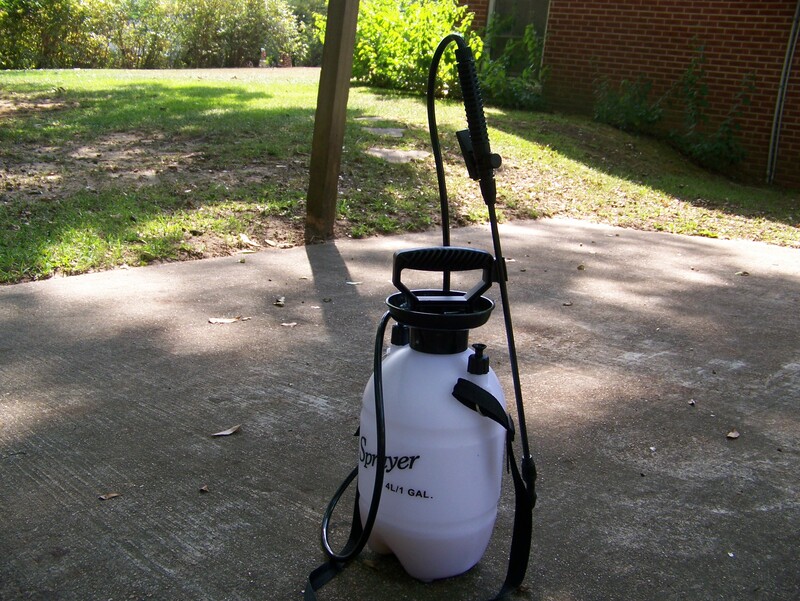 It’s amazing how far garden sprayers have come in, say, 40 or 50 years. Yep, it truly does not take much to make my day! My other great bargain is that I saved 15 cents per gallon on my tank of gas today with my Exxon reward card. Score ! I had not spent below $3 per gallon on gas in a long, long time. So here is that last bargain which leads me to today’s tablescape. 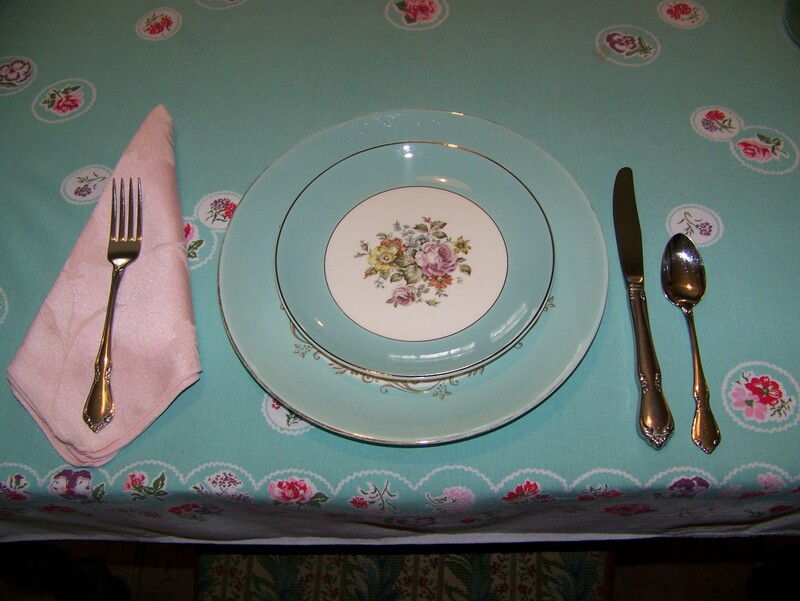 I actually found this beautiful vintage tablecloth at our flea market. I went in on vendor day to do a few things and saw this at another booth. 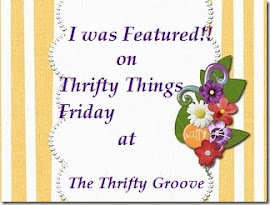 It was very reasonably priced, but I did not get it. 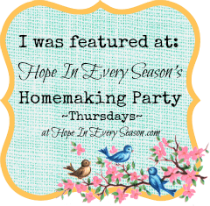 After returning home, my thoughts kept going back to that tablecloth. So this morning I went in and purchased it! I am thrilled, and I am anxious to try out my new estate sale purchases with it. So I began with one Danube and one Gold Crown dinner plate, both Homer Laughlin. Then I decided to layer on the small plates, mixing them up. The Gold Crown went on top of the Danube, and vice versa. I really like doing mix and match as well as a little something unexpected. 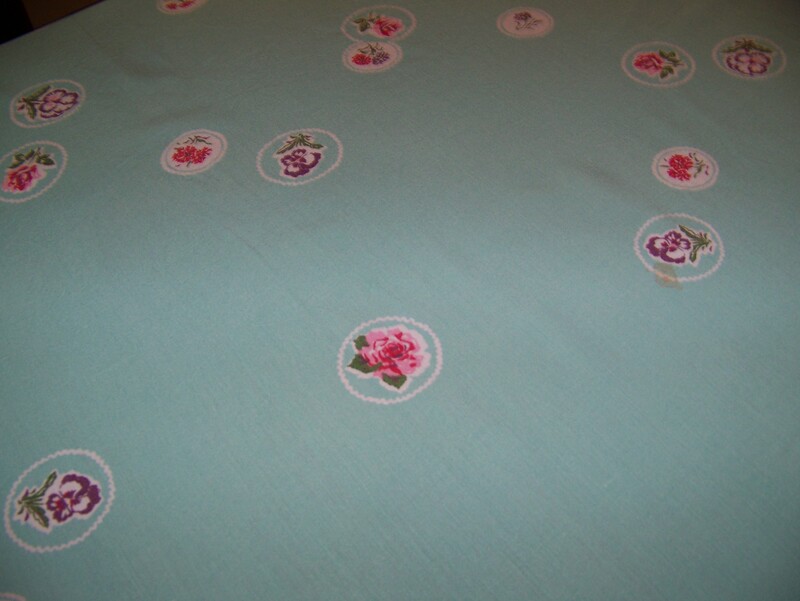 Isn’t it great that this aqua cloth has pink accents the same shade as the pink rose in the Danube? Of course, I chose the pink napkins to bring out this lovely shade. I decided just to use my everyday Chateau flatware. Did you guess that I was going to use the aqua glassware? Well, you would be right! Don’t they look great on the cloth? I just love them. I decided to use the pitcher and the Gold Crown vegetable dish as accent pieces. Love, love, love! 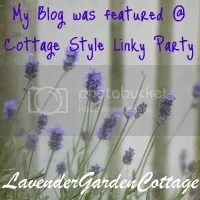 For my centerpiece, I decided to use my Fenton Silvercrest candy dish. 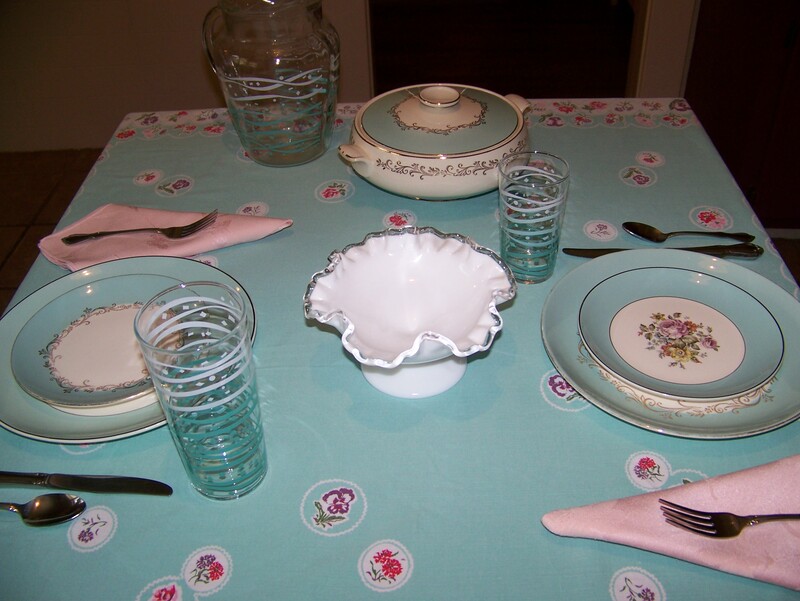 I also wanted to use my pink wine glasses to put a little more of the accent color on the table. I thought that the table needed just a little something else, so I found my sparkly stones to add some pizzaz. What do you think? I love the final result and hope you do, too. 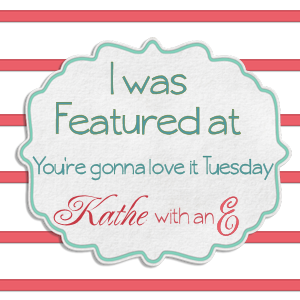 Have a great week and don’t forget to check out my internet stores! 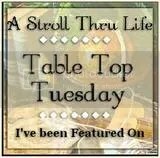 This entry was posted in Fall, Tablescapes, Vignettes and tagged antique mall, aqua, bargain, Chateau, Cunningham & Picket Danube, Dollar General, Homer Laughlin, Lifetime China Gold Crown, milk glass, pink, pitcher, saving money, vintage dishes, yard & garden. Bookmark the permalink. I love the colors on your table! And my favorite piece is the beautifully delicate vegetable dish. Are your sure that tablecloth wasn’t designed for those dishes?! 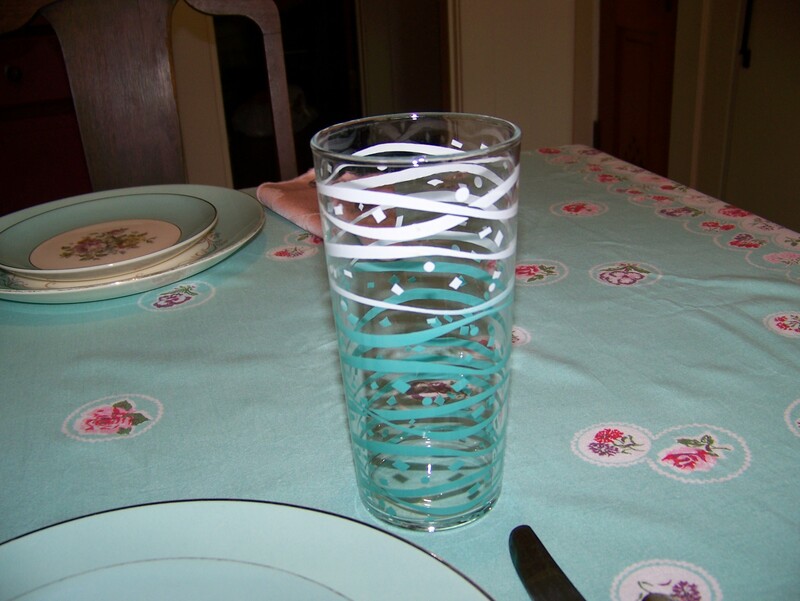 Thank you for introducing me to the joys of tablescaping – where have I been that this has passed me by – Australia! I understand your excitement over the sprayer! A prayer with a good nozzle is hard to find. What a beautiful tablescape, Bev! 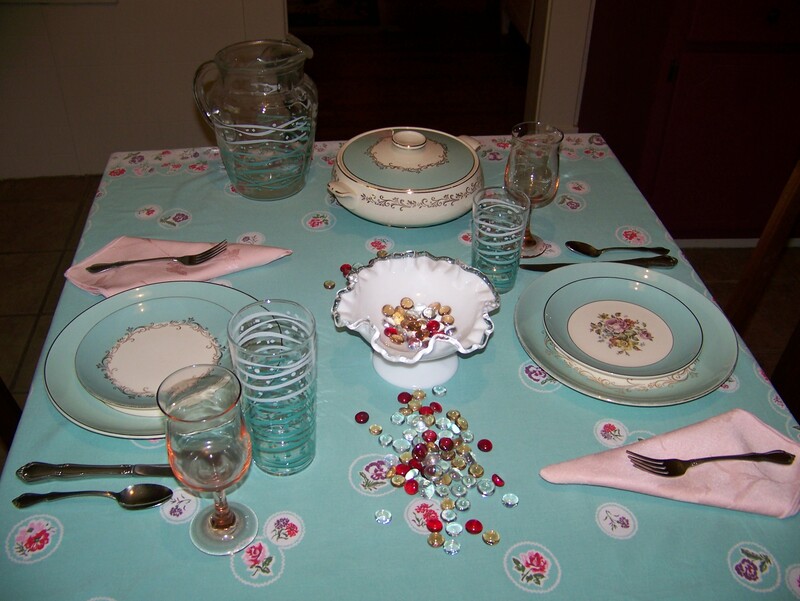 Vintage tablecloths are my weakness. I buy them to make aprons and can’t bring myself to cut them! 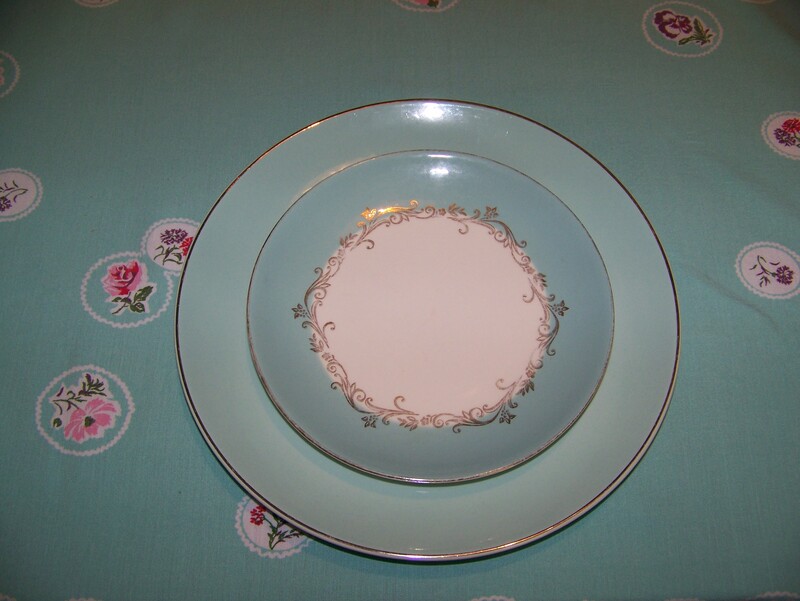 Your turquoise china is gorgeous! You have to feel happy when you look at that color! Don’t forget to pray for our friends in Colorado who were affected by the floods. I love the tablecloth Bev! It’s the perfect canvas for your beautiful dishes! I hope to someday have a piece of Fenton of my own someday. Your candy dish centerpiece is so sweet! I have a piece for sale…check out my internet store! That tablecloth was meant for you! It looks perfect with all of your aqua. Beautiful job! 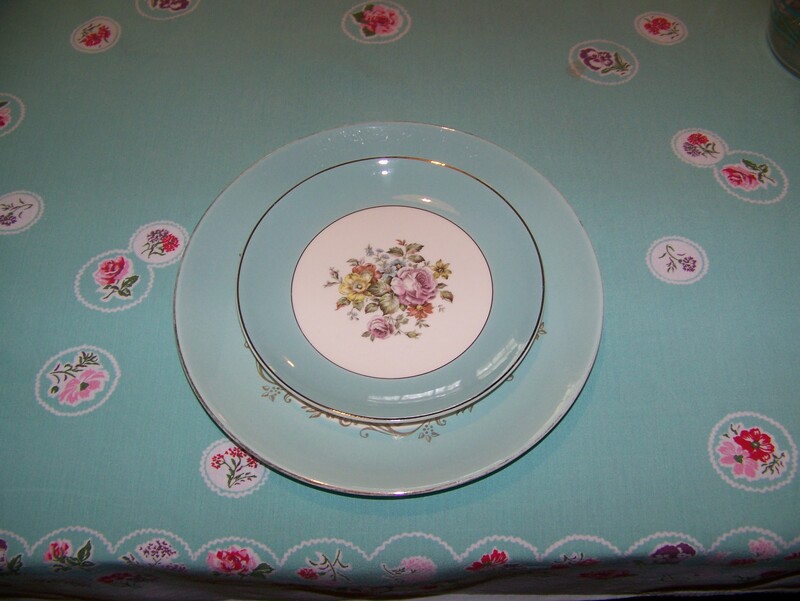 How wonderful to find a tablecloth to accent your HL china. The colors are great to mix and match! 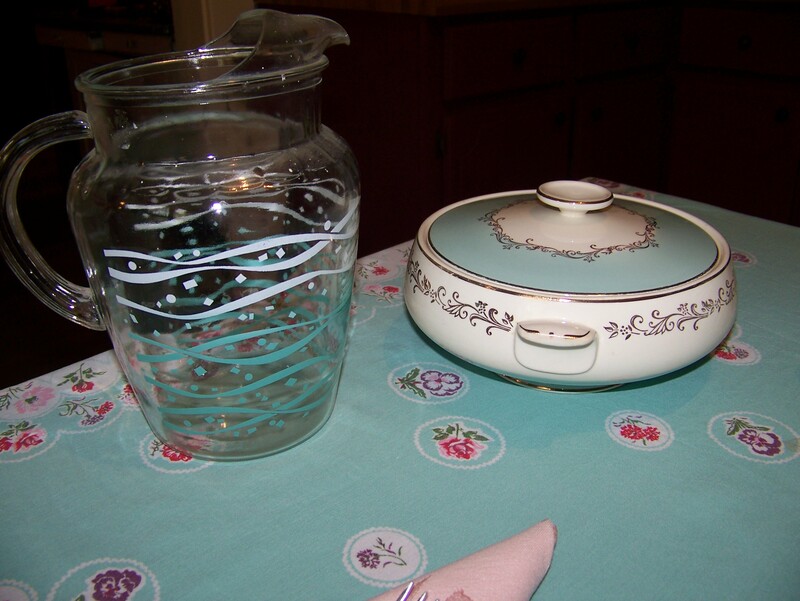 The covered casserole is lovely as your centerpiece with the pitcher. Have a great week! 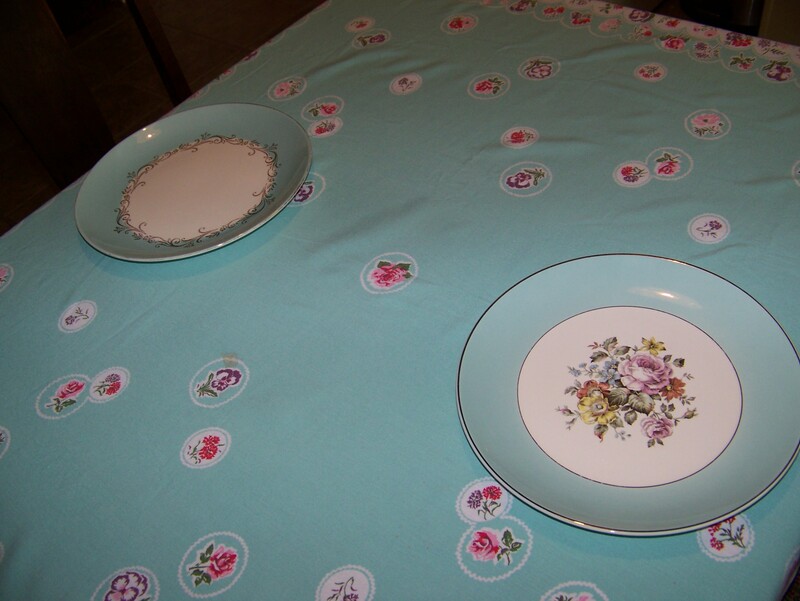 A beautiful tablecloth and dishes….a perfect table! 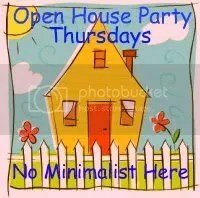 I am so happy that I stopped by. Aqua is my favorite color to do tables…don’t know why as it isn’t my favorite color! Those dishes look great with your new tablecloth. 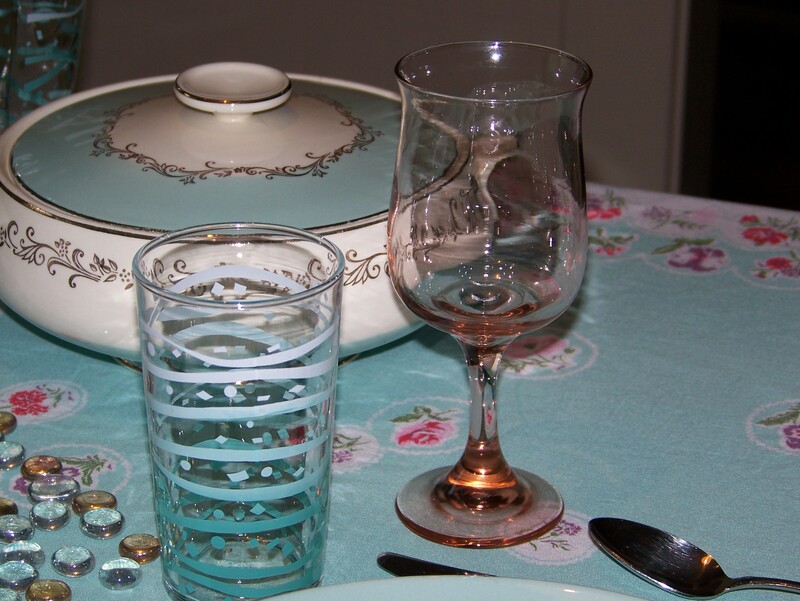 Love the pretty aqua with pops of pink! 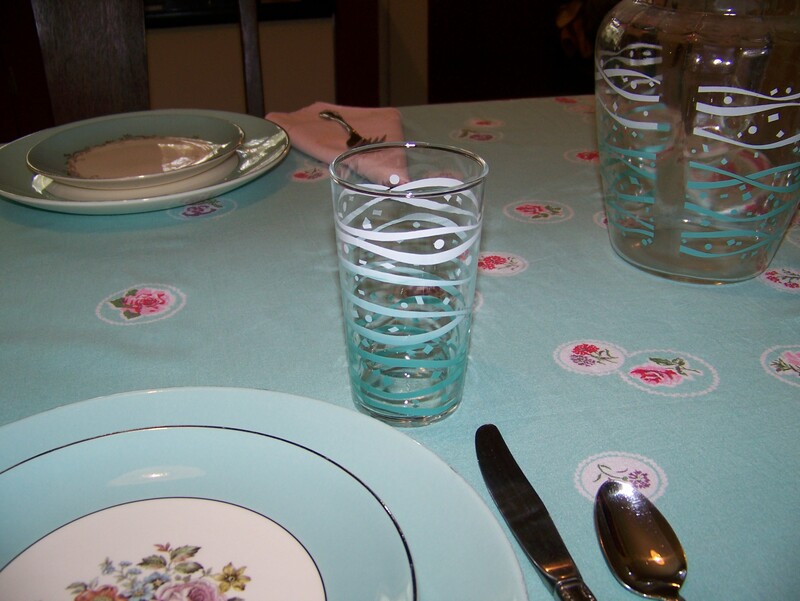 Mixing the placesettings was a great idea, and I love the aqua patterned glasses and pitcher with this table. How wonderful that you have that covered dish, too! 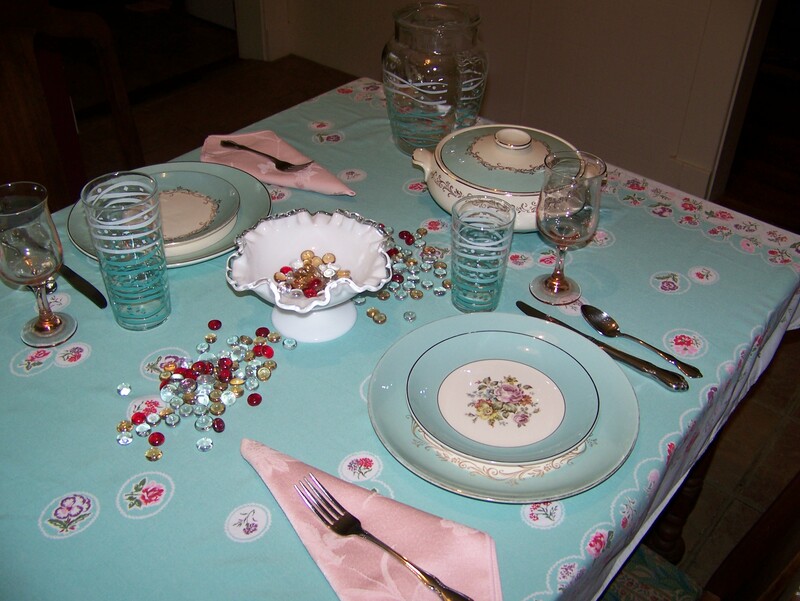 oooh I love the color of that tablescape, I have been imagining an aqua Christmas theme this year after getting some vintage pyrex to use that is aqua with snow flakes, your tablescape inspires me to definitely try it! Sounds lovely…can’t wait to see it. I love aqua and pink together, Bev. 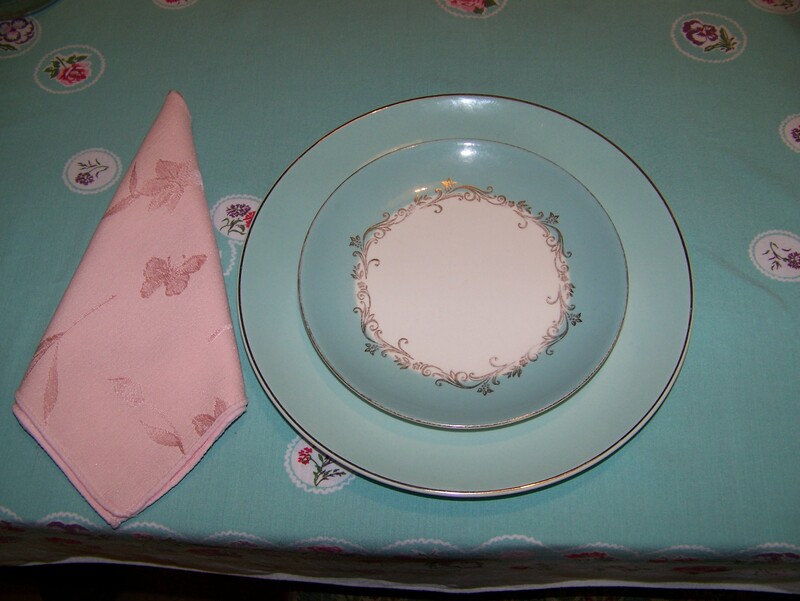 Your Homer Laughlin dishes are beautiful on your tablecloth. Great find Bev. I would have been so thrilled to find an aqua cloth like this. Love it and your table. Good choices. I knew that you would love this! Well of course you had to go back and get this set. Beautiful in all its aqua goodness! Hi Bev! Love the Aqua tables cape. It is one of my favorite colors, and always has been, even before the trend it has seen lately.